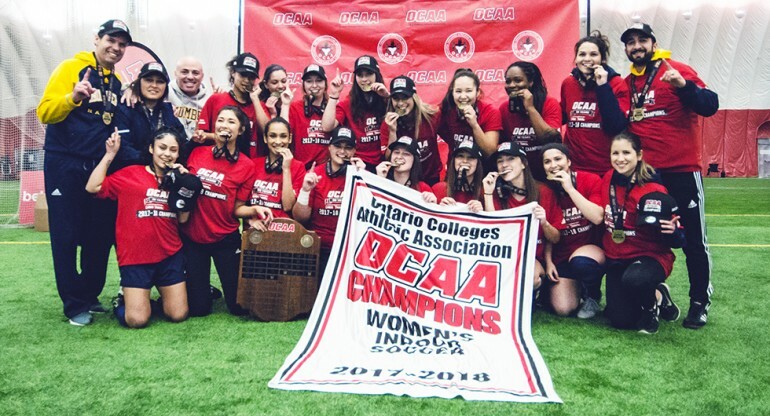 The Humber Hawks women’s indoor soccer team cruised to its second consecutive OCAA title. The Hawks surrendered only one goal in six matches during the March 22 to 24 championships at Hamilton’s Redeemer University soccer dome. But the team’s defensive acumen was matched with its offensive firepower, racking up a total of 14 goals, the tops in the tournament. The success indoors however is hopefully just a precursor of what is expected for the upcoming outdoor season. The Hawks knocked off rival Sheridan College 3-0 in the semi-final, and went on to defeat Seneca in the championship by the same margin. Second year forward Rebecca Spratt was a standout throughout the tournament for the Hawks. Spratt capped off her impressive tournament with both the Hawks final goal of the championship and being selected the championship MVP. Second year goal keeper Vanessa Fiore, notched five clean sheets in Humber’s six matches, and did so with a severely injured left hand. “It was a major concern for me and my team but I’m not the type of player to just give up on my team,” Fiore said. Due to Fiore’s stellar goalkeeping throughout the tournament she was awarded the top goalkeeper of the tournament. “Being awarded top goalkeeper and winning gold was my main goal,” she said. Shaniece Bennet was a scoring wizard for the Hawks. Bennet scored goals in five of the Hawks six matches, and was named a tournament all-star. The Hawks in the championship game got goal scoring from three of their impressive second-year players and another clean sheet from Fiore. Midfielder Giulia Zanardi opened the scoring early in the first half. In the second half, forward Bennett scored an insurance marker, and forward Spratt put the game out of reach by scoring the Hawks third and final goal of the game. The Hawks will look to take the momentum from this win into next year’s outdoor season. Fiore says the Hawks will need to come in emotionally, physically, and mentally ready for next season, but she thinks the team is ready to put in the work. “Theres nothing more important to our team wants than winning an outdoor gold medal,” Fiore said.